Let’s have some fun. With this post I’m announcing a book-a-month giveaway. For starters I’m offering a book by Thomas Merton, the Trappist monk. For free. All you have to do is enter and be the lucky one to have your name drawn. Call it the Carlen Lotto. Here’s why I’m picking Merton as my first author. Last September, Pope Francis blew away some thick cobwebs from my memory. That’s when he spoke to members of the U.S. Congress, calling out Merton in the same breath with Abraham Lincoln, Martin Luther King, and social activist Dorothy Day. I was reminded instantly of the role Merton played early in our journey when my wife Martha was diagnosed with Alzheimer’s. I was struck by this realization: Few authors have influenced the direction of my thinking more than Thomas Merton. Last week I mentioned briefly how his writings helped prepare me for our crisis. Merton died a couple of decades before I discovered him in the early 1990s. Out of that discovery I learned, among other things, about St. Anthony and the other Desert Fathers and Mothers of the 3rd and 4th centuries; about St. Teresa of Avila and St. John of the Cross of the 16th century; and about the practice of contemplative prayer and a simple but meaningful approach to reading Scripture called Lectio Divina. Scanning my bookshelves today, I see three dozen or more books that Merton wrote, or that were written about him, or that he’d directed me to. I spent a week alone in Merton’s hermitage (or cabin) in the thick of our crisis, about which I devote a chapter in my forthcoming book. And Martha and I, shortly after her diagnosis, met with the monk who was a Merton “trainee” and ultimately was Merton’s confessor, who also quickly became the object of Martha’s school-girl crush. Among the first books I read of Merton’s was his best-selling autobiography, The Seven Storey Mountain. It fascinated me: born to artist parents in France; losing his mother at six; shuffling between America and Europe; trying on a bohemian lifestyle. A student at Columbia University, Merton showed early signs of a brilliant literary future when, at 26, he decided to become a Trappist monk and entered the Abbey of Gethsemani in Kentucky. Five years later, he wrote this autobiography. Few people have the courage—or is it the audacity?—to write an autobiography when they are 31 years old. Anyone is eligible, whether you subscribe to my newsletter or not. Simply send an email to carlen@carlenmaddux.com between this Friday, January 29, and next Wednesday, February 3, by 11:59 PM EST. Indicate that you would like to be included in this month’s book giveaway. It will help me if you put in the subject line: BOOK GIVEAWAY. One person—maybe you!—will be selected at random from those entering. I will send you a congratulatory email on Thursday, February 4. You will have 48 hours to respond to my email. If I don’t hear back from you by then, someone else will be selected at random. I plan to give away several more books from different authors in the coming months, via posts on the last Friday of the month. For more details, click Book Giveaway. With the recent celebration of Martin Luther King Jr. Day, I’ll close with this story. Merton and King had never met as far as I can tell, although they had corresponded for a few years. Both were, among many things, peace activists opposing the Vietnam War. They had several mutual friends, including the Buddhist monk Thich Nhat Hanh, who was exiled from Vietnam for his opposition to the war. Merton invited King to Gethsemani for some much needed rest. King finally found the time for a visit, and let Merton know in early 1968 he would come to Gethsemani after a stopover in Memphis to support a strike by black sanitary workers. Eight months after King’s assassination, Merton was accidentally killed in Bangkok, the victim of an electrical shock. King was 39; Merton, 53. I wonder to this day what might have emerged had this Baptist minister and Catholic monk been able to share experiences face-to-face, in communion with God and with each other. P.S. Feel free to send this offer to your friends. If you haven’t signed up for my free weekly newsletter and would like to, please go here. 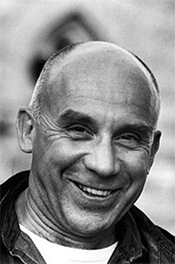 Note: The photograph of Thomas Merton is by John Lyons. Used with permission of the Thomas Merton Center at Bellarmine University, Louisville, KY. Older PostWhy Didn’t I Just Accept Our Fate, and Live with It?